When your thinking about booking your baby in for a newborn photo shoot it’s natural to have lots of questions, I have put together this blog post to answer some of the most common questions parents ask. If you have any more questions let me know and I’ll update this blog to include them. We aim to photograph babies between 1-14 days old. At this stage, they are sleepy and more able to be gently posed into position for the photoshoot. It is possible to get photos with slightly older babies, it may just take a little longer. When can I book my babies photoshoot? As early as possible. When you have had your scan and have a due date is the ideal time to book your baby in. I can only photography so many babies, so by booking in early, you can secure your slot. Once baby arrives we can then book in a firm appointment. It is sometimes possible to squeeze in late bookings but I cannot guarantee this so I always advise early booking where possible. Where does the newborn photoshoot take place? Newborn photo shoots always take place at my studio. This is for various reasons. Logistically a newborn photoshoot uses a lot more equipment that might expect. I would not be able to fit all of this into my car. There is also space needed for this equipment, most homes would require furniture to be moved around not really want you want to be doing with a newborn. The studio is set up with your newborn in mind, the temperature is set for their comfort and the layout ensures there are no potential trip hazards, everything I need is close at hand. There is a large sofa for you to relax and watch from. Can I take photos during the shoot? We don’t allow anyone else to take photos during the session. This can be distracting for us when working with your baby and can also slow down the session. We are always happy to provide one sneak peek image for you a few days after your session so you have something to show family and friends. This all depends on your baby, we can’t rush them, usually between 3-4 hrs. How warm is the room? To ensure your babies comfort the room is kept between 26-30Deg C. So very snug for us adults, but baby will be nice and comfortable throughout the session. Keeping the room warn helps keep your baby sleepy throughout the session. What happens if my baby starts to cry during the session? I am very used t working with babies and will always initially attempt to settle them myself where possible. This avoids us moving your baby and then needing to get them comfortable again. Sometimes they just need a little reassurance and then settle back down. If it is obvious that they actually need something more I will pass them back to their parents for feeding or cuddles. Once they are ready we will then continue the session. Your baby will get hungry, in fact, the warm room usually makes them want to feed more than usual. If they are hungry I will pass them back to you for feeding and prepare for the next part of the session. Keeping baby well fed ensure they fall into what we affectionately call a ‘milk coma’ and makes them nice and sleepy. Can I choose the poses you photograph? I am always happy to discuss ideas you have and look at examples of this. I do have a particular workflow I use when working with babies. I have found this to be effective in getting a wide variety of images for you to choose from whilst also disturbing baby as little as possible. I will incorporate poses you are hoping for where possible. It will also depend on your baby. Like adults, babies have certain positions they feel more comfortable and different levels of flexibility. I will always try poses but if your baby is not happy or uncomfortable I will never force them into the position just to get a photo. In the end, we want to create beautiful happy images, with your babies comfort being the main goal. Can we choose the colours and props you use? I am always happy to discuss these with you, I have a variety of different props and backdrops available and can discuss colours which work well together. We can also talk about where you wish to use the final images and think about colours which would work well with that. Of you course, you can. I always encourage parents to bring toys, sentimental items or outfits along. I will discuss how these can fit into the shoot and be honest if they may not work. I am always happy to try for you. Can parents be included in some photos? I love it when parents want to have photos as well. It’s such a special time and to have you involved as well will create something you will treasure. Feeling a little shy? Don’t want your photo taken? 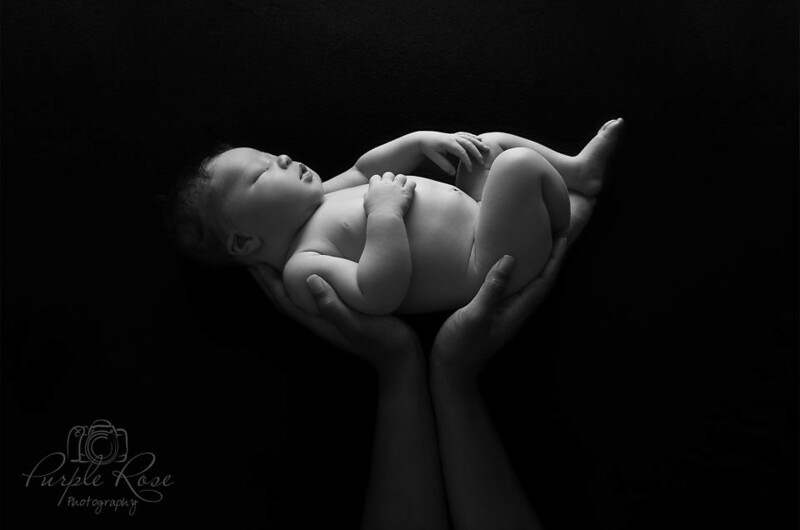 I have other ways to incorporate parents, how about a silhouette of you holding your baby? These are stunning and really popular with parents. We can also just photograph your hands holding baby. This way you are still in the photographs. Of course, they can. I always suggest bringing another adult along who can take the sibling/siblings out once their photos are taken. Experience has shown me that it is almost impossible to settle your newborn and get them sleeping with a sibling running around the studio. A newborn shoot is also long and can be difficult to ask a small child to remain still and quiet for up to 4hrs. There is a park within walking distance or I suggest maybe a friend or one parents takes them out for some special one on one time, while we finish their little sibling’s photos. Do you do maternity photoshoots? Yes, I do. I am happy to discuss a package if you would like a maternity and newborn photo session. What if my baby poo’s or wee’s on the set? I expect this to happen, they often get me as well. There is no need to worry, everything is washed after each session and if your little one manages to really get me I’ll pop out for a quick change of clothes, no harm done. It’s completely natural and I fully expect it to happen. What if my baby is not settling, will I not get any photos? I have had some babies take 2 hrs to settle, but we got there in the end. Don’t panic, just relax and be patient. The art of photographing newborn’s is patience, we have to work at babies pace. If they are really unsettled I may suggest you come back in a few days and we can try again, we all have bad days and sometimes it’s just better to try again later. I always start sessions by swaddling your baby 9 out of 10 times this along with a belly full of milk and a warm room settles them. I will also start the session by getting to know your baby. Settling them on my lap while I swaddle them so they can get used to me, this also lets me see what their startle reflex is like and how they react to being moved. Some babies love moment, some like to be still, some like noise, some little quiet. The first part of the session is all about working out what your little one likes to keep them happy throughout the sessions. Can I have the unedited images or take photos of images I don’t purchase? Unfortunately no. I don’t release unedited images or allow photos to be taken of images not purchased. How much do you edit my baby’s photos? I gently re-touch your baby’s photos. By this I mean I will darken or brighten images where necessary, create a pleasing colour balance and gently edit their skin. Removing and dry flaky skin or newborn acne. My baby has dry skin, should I oil or moisturise them before their photo shoot? Oiling or moisturising your baby can create a greasy sheen on their skin which I will not be able to edit out of their photos. If your baby has lots of dry skin you can try bathing to gently remove some of this, I will then edit out the remaining flaky skin on your chosen images.